A cavity is basically a hole in the tooth. Cavities, also called caries or tooth decay, constitute the second most common health disorder in the western world and a common cause of tooth loss in young people around the world. Cavities start small and gradually become bigger when they’re left untreated. People who are at the highest risk of developing cavities include low-income families, seniors, people who drink non-fluoridated water, people undergoing radiotherapy, diabetes patients, smokers, alcohol and drug users, and people who consume large amounts of sugary drinks. According to a recent National Institutes of Health (NIH) estimate, 90% of cells in the human body are bacterial, fungal, or otherwise non-human. The good news is that most of these bacteria are harmless, and some are even beneficial. The bad news is that some cause all sorts of health problems, including oral diseases like cavities and periodontal disease. These bacteria are incredibly tiny, measuring only 1/500th of a human hair in width — but what they lack in size, they make up for in numbers. By one estimate, there are at least 300 different species of bacteria living inside your mouth, totaling more than a billion at any given time. When you’re having lunch or dinner, it’s not just you that’s feeding. All that bacteria inside your mouth is having a picnic too, munching on the sugars in the foods and drinks that we consume. But what goes in, must come out. After they’ve had their snack, the bacteria will excrete waste in the form of a biofilm that your dentist calls dental plaque. If plaque stays on the teeth for more than a few days, it hardens and becomes a substance called tartar. The plaque is what allows the microorganisms to stay on your teeth for longer, until they make acids, which wear down the tooth enamel. 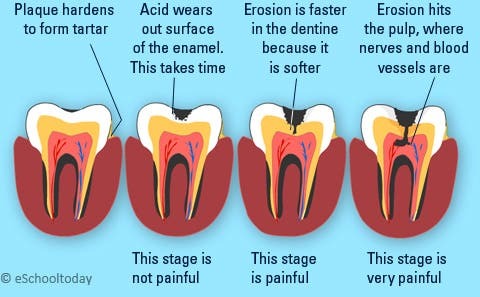 After the enamel is worn out, the acid reaches the next layer of the tooth, called dentin, which is softer and far more susceptible to acid than enamel. Finally, the bacteria and their acid reach the pulp. This is what eventually will get you cavities. The bacteria in the plaque will also attack the gums, causing gingivitis. If left untreated, gingivitis can evolve into periodontitis, a far more serious condition where there is bone and tissue loss around the teeth. Besides sugar, other foods that cause the bacteria in your mouth to produce acids are starches — such as bread, crackers, and cereal. What’s more, the bacteria that cause cavities are spreadable. Yes, tooth decay is actually an infectious disease and according to a study published in the journal Microbiome, an otherwise innocent ten-second French kiss can spread 80 million bacteria between mouths! Cavities are most commonly found where plaque forms the most easily, such as on the molars, between teeth, near the gum line, and at the edges of fillings. More than nine out of 10 American adults have cavities, according to the National Center for Health Statistics (NCHS), and more than a quarter of American adults have untreated tooth decay. It’s extremely important that you visit a dentist regularly have radiographs of your teeth. Because early cavities don’t pose symptoms, you might not realize you have tooth decay until it may be too late, i.e. the cavity gets too big. Some signs that you may have cavities are discolored spots on the tooth and sensitivity to cold. In the later stages of a cavity, the pulp, which is the nerve, is visible. This makes the tooth sensible to heat, cold, sweets, and drinks. If the decay progresses long enough, parts of the tooth may fall off and the tooth may become highly sensitive to pressure. Bad breath and bad taste in the mouth are also symptoms of late cavities. Root cavities are most commonly found in older adults, who are more likely to have receding gums and other gum disorders. Receding gums expose the roots of the teeth, which become vulnerable to tooth decay now that there’s no more hard enamel to shelter them. To treat a root cavity, the decay is first removed and the hole in the tooth is plugged with a filling or crown. In extreme cases when the decay has spread to the pulp, root canal treatment is advised. A root cavity needs to be fixed as soon as it’s detected because the damage spreads quicker than in other areas of the tooth where the enamel is tough. Pit and fissure cavities appear on the chewing surfaces of teeth, most commonly on the back teeth. Most often, this type of decay is due to inconsistent and careless oral hygiene habits. 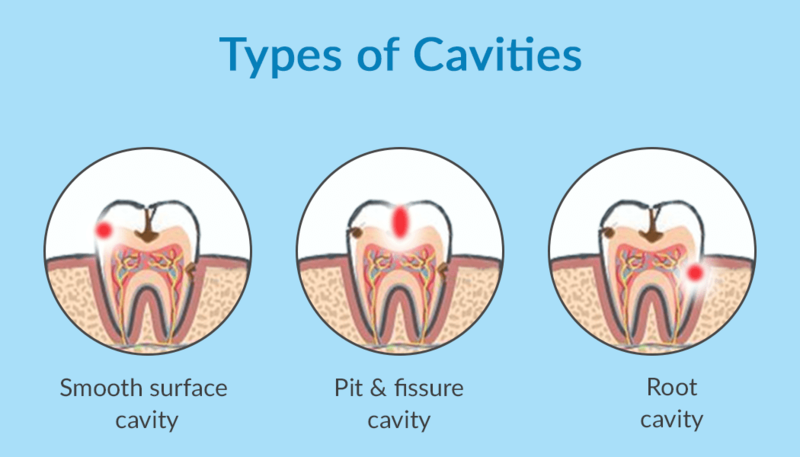 This is a very common type of cavity because it’s easy for food particles and plaque to get stuck in the grooves and crevices present on the top of the teeth. If detected early, pit and fissure cavities can be treated with a good fluoride toothpaste. However, if the decay reaches the dentin, the cavity needs to be removed and the tooth repaired with fillings, composites, or crowns. Smooth-surface cavities appear on the flat exterior surface of teeth and are most commonly found on the teeth at the sides of the mouth. They occur when people do no brush correctly or regularly. These are the slowest-growing cavities and also the least common. Because this type of decay grows slowly, it’s also the easiest for a dentist to treat. Some may not need filling at all and can instead be fixed with fluoride treatments like toothpaste, gels, varnishes, or fluoride-enriched water. In order to keep oral bacteria in check, we need to manage them through proper oral hygiene, healthy diet, and regular dental checkups. Brushing technique recommended by the American Dental Association. Fluoride mouth rinses also help reduce and prevent tooth decay; but you should always talk to your dentist about any new products you are interested in trying, because not everyone should use a fluoride mouth rinse. Because there is little scientific evidence that suggests flossing keeps teeth and gums healthy, the Department of Health and Human Services has dropped their recommendation to floss daily. 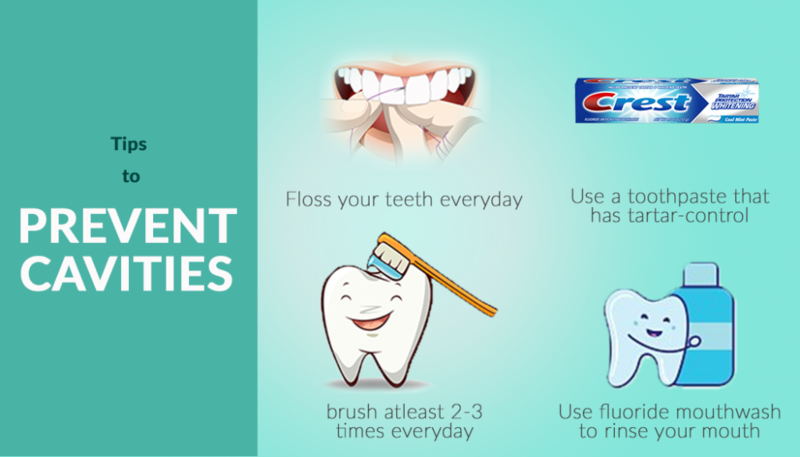 Many dental practitioners still advise patients floss their teeth daily, nevertheless. In terms of diet, minimizing sugary and starchy food are important for keeping bacteria at bay.